The final feature of the odd cinematic trilogy was the simple replaying of a speech Mr. Nixon had given more than two decades earlier—on September 23, 1952—at another embattled moment in his career. The grainy video was designed to be the program’s pièce de résistance. 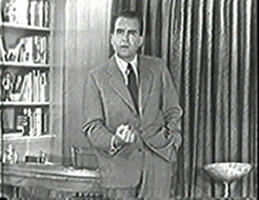 But as a much younger Richard Nixon delivered his remarks on the screen that day, it was the audience that Gannon noticed. 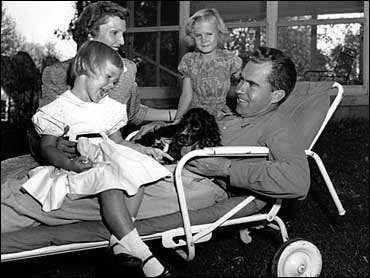 For whatever reason, the sarcastic hisses had stopped as Nixon spoke of finances and family and a dog named Checkers. It was almost as if these decidedly anti-Nixon partisans were suddenly fascinated. They were. Many still are. He was 39-years old and on the verge of national leadership—the junior United States Senator from California and the Republican nominee for Vice President. He was living the American dream and fulfilling many of his own. And along the way, he carried the hopes of a new generation of Americans, those who had emerged from the darkness of global conflict with renewed resolve to embrace life and ensure that such a catastrophe never happened again. In fact, this rising political star whose magnitude had increased so dramatically in six short years, had already experienced the clash of personalities and ideologies that was to define his generation. Richard Milhous Nixon would be a transcendent political figure in America for quite some time. His name would appear on five national ballots—a feat equaled only by Franklin Delano Roosevelt—two times for Vice-President and three for President. And like FDR, he would lose only once, and that barely to another young politician, this one from Massachusetts, who was making his own history in 1952. Mr. Nixon is most often remembered through the prism of how his career—at least the public part—ended in August of 1974. This is not only unfortunate, but it also prevents us from figuring out how this man who fathomed such deep valleys managed to actually scale the highest political mountains extant. How could Nixon have done all he did if the caricature of him in the minds of so many Americans was an accurate characterization? Understanding what he did in 1952 is crucial to processing all the rest. What is lost to so many in the fog of all that later transpired, is that Richard Nixon was actually right on the facts, as well as the politics, in 1952. He did not wiggle out of a mess. In fact, he demonstrated a clear capacity for communication and connection with the American people. It was the dawn of the television age—the beginning of an entertainment, information, and communication seismic shift. In living rooms around the country, the large radio, complete with it’s prominently displayed dials, would be exiled to elsewhere in the house and the furniture would begin to arrange itself around the new media kid in town. The device that Edward R. Murrow would later characterize as “lights and wires in a box,” would eventually become so essential to Americans that they wondered how they ever lived without it. Although, until that September night when Richard Nixon spoke “coast to coast,” the shift from wireless to tube was anything but a done deal. And as the young politico prepared to make his case to the American people, he had no way of knowing that not only what he had to say would be important, but where he said it would be, as well—even more so. It was the first synchronization of medium and message for a new age. This was the moment when television began to trump radio—even motion pictures—as the entertainment choice du jour of Americans. We loved Lucy, watched “Uncle Miltie,” and got our information more and more as much from Edward R. Murrow as from the venerable morning and evening newspapers. In fact, in many ways it was the Checkers speech that signaled the beginning of our ever since fascination with the glowing tube. More Americans watched Nixon that September night than would watch any single event on T.V. for many years to come. But even politicians were slow to figure out what it all meant. The Republican National Committee put their Vice Presidential candidate on two radio networks (Mutual and Columbia; MBS, CBS), while on only one television hook-up (NBC). But, no matter—suspense built, and by airtime at 9:30 p.m. (eastern) on Tuesday, September 23, 1952 nearly 60 million viewers tuned in—an unheard of audience up to that point and well beyond. Forget what else was airing or happening, or that Jersey Joe Walcott was defending his World’s Heavyweight Boxing Championship that very night and hour against a guy named Rocky Marciano—the fight had been blacked out on radio and television anyway and could only be seen live in Philadelphia or via a primitively skeletal network of closed circuit venues (complete with its famous knockout punch)—people wanted to hear what this man accused of financial improprieties would have to say. Would he resign from the Republican ticket? Would he tell the truth? Would he really give out his personal financial details when no other politician at the time did? What viewers saw that night was a presentation—primitive in its production quality, in keeping with the technology of the young medium—carefully crafted and skillfully delivered. It was a deliberately arranged combination of facts, figures, family, and country. At moments it was clinical. Occasionally it was corny. But it all worked. The great General of World War II and D-Day, Dwight D. Eisenhower, the Republican candidate for President and the man who held Nixon’s fate in his recently-indecisive hands, made notes as he watched his young running mate on television. And at one point, something Nixon said so disturbed him that he broke his pencil on his pad of paper. Mrs. Eisenhower wept as she watched. Mrs. Nixon sat near her husband at the otherwise empty El Capitan Theater in Hollywood. Some reporters saw his wife’s presence cynically, but they soon forgot about it as Mr. Nixon told a story that would chisel this small screen moment in storied stone. It was about a cocker spaniel: Yep—a dog. A dog named Checkers. The broadcast was missed by many and dismissed by many more. The Democratic nominee for President that year, Adlai Stevenson—a man who prided himself on his use of the spoken word—didn’t even bother watching. He was convinced that television was a passing fad for plebeians. And even after watching the speech, Mr. Eisenhower still did not know what to make of, or do, with Nixon. It was powerful political drama, but more than that—it was great cultural drama. Nixon didn’t read a script or use a teleprompter, but rather he used a few notes to aid his prodigious memory, as would be his style throughout most of his public career. He demonstrated a mastery of detail and appeared to Americans as a sort of new kind of political communicator—just a guy having an animated conversation with friends. When the half-hour was up, the camera lights turned off before the candidate could actually give out the contact information for phone calls and telegrams to the Republican National Committee. Mad at himself for such an inexactitude, he was certain that he had failed—until he noticed one of the cameramen crying. Calls and telegrams overwhelmed the RNC. It was quickly obvious that Nixon had not only won the day, but that he had tapped into something powerful. He had gone directly to the people in a way not really done before. Americans had read and heard speeches for generations, but this was something different—they saw and, for a brief and shining moment, they connected. And what too many casual observers miss is that Richard Nixon not only survived his first firestorm, he triumphed that night in 1952. Excellent reminder of this historical speech that lead and propelled a man to become one of the most controversial figures in American history.